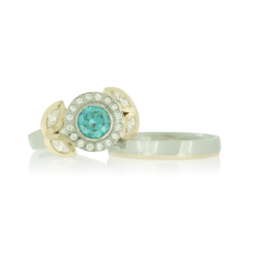 Blue and colourless diamonds set in platinum and 18k Fairtrade Gold. This engagement ring is set with the client’s own blue and marquis diamonds. The design is inspired by a love for the ocean and Art Deco design. Diamond melee are set around the centre stone in platinum, while the marquis diamonds are set in 18k yellow gold. The design is also made to receive a bespoke dual coloured wedding band in platinum and gold.